Although demographic indicators – including race and ethnicity, age, gender, and education – were not used as factors to create the typology groups, there are clear patterns across the seven groups. The religious typology groups roughly move from oldest to youngest when going from the most to least religious. Sunday Stalwarts and God-and-Country Believers tend to be somewhat older, while Religion Resisters and Solidly Seculars are younger; the remaining three groups fall in between. Solidly Seculars are the only group made up mostly of men. Sunday Stalwarts, meanwhile, are the only typology group in which a majority are married. And the Diversely Devout are the only one that is not majority white. Religion Resisters and the Solidly Secular have the highest levels of education, when compared with most groups. Sunday Stalwarts and the Spiritually Awake have slightly lower levels of educational attainment. And the Diversely Devout and God-and-Country Believers have the least amount of education – just one-in-ten members of each group have completed college. And while nearly half of Solidly Seculars have household incomes of $75,000 a year or more, a majority of the Diversely Devout earn less than $30,000. In terms of income, the five other groups fit in between these two. Members of the highly religious typology groups tend to be older than those in the nonreligious groups. For example, one-third of adults who are Sunday Stalwarts are ages 65 and older. And they, along with God-and-Country Believers, have a median age of 54. 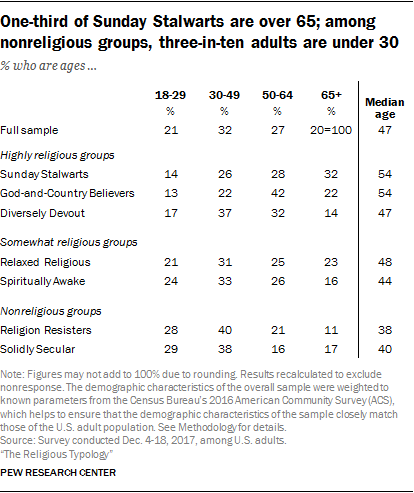 Religion Resisters and Solidly Seculars, on the other hand, are much younger; three-in-ten adults in these groups are under 30, and nearly seven-in-ten are under 50. In their age composition, the Relaxed Religious and Spiritually Awake are closer to the general public overall. Women make up a majority of Sunday Stalwarts, God-and-Country Believers and the Spiritually Awake. (Indeed, women are more likely than men to be highly religious in many places around the world, particularly in Christian contexts.) By comparison, the Diversely Devout, Relaxed Religious and Religion Resisters are more evenly divided between men and women. Meanwhile, about two-thirds of the Solidly Secular are men. This is in line with previous Pew Research Center studies that have found a clear majority of self-identified atheists in the U.S. are men. Sunday Stalwarts are the only group in which a majority of members are married (57%), while God-and-Country Believers and the Relaxed Religious are about evenly split between those who are married and unmarried. Roughly two-thirds of the Diversely Devout (68%) and Religion Resisters (65%) are not married. The Diversely Devout is the only group that does not have a white majority: Three-in-ten are Hispanic, roughly one-in-five are black, and about one-in-ten are another nonwhite race or ethnicity (or mixed race). By comparison, 60% or more of those in each of the other religious typology groups are white. Among all of the typology groups, the Solidly Secular has the highest share of white members (79%). The nonreligious typology groups tend to be the most highly educated, with about four-in-ten people in both the Religion Resisters (40%) and the Solidly Secular (45%) holding a college degree. The Diversely Devout and God-and-Country Believers have the lowest levels of educational attainment, with about six-in-ten in each group saying they have a high school degree or less education. Income often is closely correlated with educational attainment, and the Solidly Secular earn the highest household income, with nearly half (46%) saying their income is $75,000 or more. One-third of Religion Resisters and the Relaxed Religious also live in households where the annual income exceeds $75,000. About one-quarter of Sunday Stalwarts, God-and-Country Believers and the Spiritually Awake report household incomes of $75,000 or more, while just one-in-ten of the Diversely Devout say the same. People from each typology group can be found all around the country. But fully half of God-and-Country Believers live in the South, as do 44% of Sunday Stalwarts and 43% of the Diversely Devout. Three-in-ten Religion Resisters and Spiritually Awake Americans live in the West, compared with only about two-in-ten among the highly religious typology groups. In their geographic distribution, the Relaxed Religious closely resemble the U.S. general public.